How’s Your Content Strategy Looking? 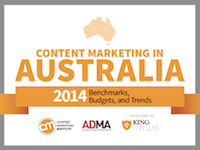 Recent research from the Content Marketing Institute, ADMA and King Content tells us that 93% of Australian marketers are using content marketing. So if you’re a marketer reading this blog post, there’s a good change you’re using content marketing. However, how confident are you in the execution of your content marketing strategy? This past week I met with a client in the publishing industry. Unlike many companies, they have no shortage of content. At the same time knowing how to best deliver that content can be a struggle. I completed the Eloqua Content Marketing Grid exercise, it takes no more than 5 minutes and it gives you a framework, based on what you have available today and gives you a model to base your campaigns on in line with the buyer’s journey. Click Here to complete your own grid. This link will take you to a page I built for work (this is my personal blog), so please be aware that you’ll more than likely be dropped into a lead nurturing campaign. You can unsubscribe at any time.